Professional Singapore Mover | Mover Service | House Mover? Why Choose Us As Your Moving Company? Singapore moving company provides office, home moving service to all the clients in Singapore who might be interested in relocating from one place to another. They are well recognized in Singapore due to their best services which they offer of relocating ones premises from one place to another and also moving clients homes from one place to another. Hence becoming more reliable to many people in Singapore who may need their services. As the best house mover this entails all moving services, which includes availability of storage space especially when moving items such as safes, pianos and other organs is facilitated to. Their suitability of well-trained movers creates a room of offering better services to all the clients, within the 24hours catering for ones needs as expected. Offering fast move of relocating ones home or office from one place to another. • Availability of dismantling and assembling Furniture items. Due to their capability of being the best house mover they can take great care of dismantling ones belongings such as furniture item and assembling them back to their original configuration and layout. Time saving can be a key factor to their trained movers when dismantling different items for transport and dismantling them at their destination as needed. • Well protective wrapping services. For all house and office moving services, different kinds of protective features and items such as corrugates paper are mostly used in protecting all the bulky items, especially the furniture items which needs great care. Availability of usage of bubble wrap in protective fragile items such as table made of glasses offers great protection from further damages during transportation. Newsprint enhances tidiness within the goods at all the time when loading and off loading the goods from the vehicles. All goods which are made in shape, their security is maintained with usage of pallet stretched film, which assists in ensuring that no marks are been left on them during the time of moving from one place to another. • Better disposal and storage services. As a result of having self storage buildings, they greatly cater for their customers be extending hours for them to get access of their storage units on a daily basis. Renting space for storage of items is the best option of ensuring safety and security of items especially for the people who want to free space to store their goods. 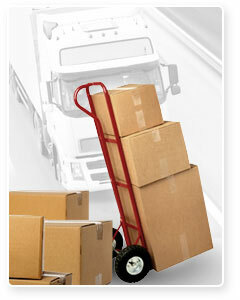 Anyone choosing Singapore moving company especially in relocation of office from on one place to another. Stronger boxes and most unique packaging are ensured for better and safer transportation to the recommended and designated location. This ensures that office equipment and items which need great care arrive as safe as they were in the original state. The used bins, boxes and bins can however be recycled and used later in offering same protection in other field. Provisions of best residential services to all the clients are facilitated especially when moving to new homes; better plans are made to ensure that the process goes smoother and efficient as needed. With better decorations made due to the waited furniture items to be well arranged in a greater perfection as needed. • Knowledgeable and well experienced staff. Many of the clients really understand the well hardworking staffs, who know their work agendas of handling goods and services with great care. Customers don’t have the need of supervising these staff because they are trustworthy in whatever they perform. Especially with all the services which concerns packing, transport, painting services which they offer in a great quality and better ways of receiving goods to their storage. The cost of moving is mostly determined by the amount of god and the distance of transportation to the place of delivery. Their costs are offered at an affordable, at a low rate to all the customers in which they don’t consider the distance or the weight of the items to be transported. • Ability of organizing and scheduling the move in advance. 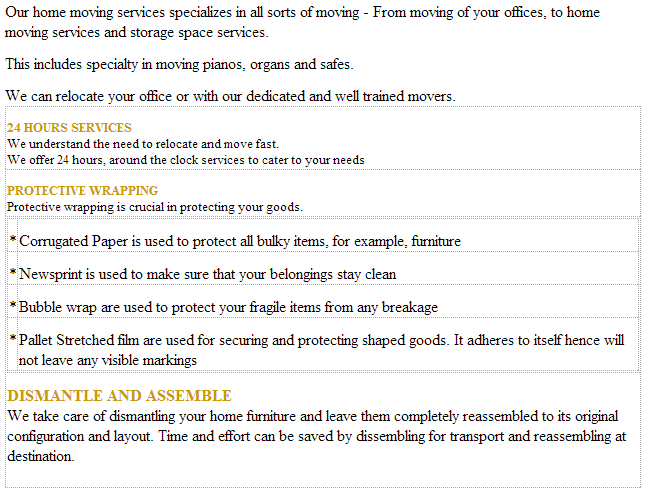 Whether is the job relating to office move or house move, the company prepares and sets a timely table for such a job. This gives their customers a better chance of getting prepared and ready before the actual move takes place. All the clients have a better chance of organizing their belongings in advance and avoid the issues of not packing other items, since better time is facilitated in advance. Unlike other house and moving companies in Singapore, this company offers packing facilities in which their staffs are the one who get involved in packing and off loading of the items. With other companies, customers themselves get involved in performing those services which makes it different with Singapore moving company, in which their professional staff get involved themselves. • Reliable, convenient and most efficient. Their effectiveness and better house mover and office mover services are well identified, during all the time considering whether is during the holidays or on weekends. With their daily duty staff in the office at all the time. This facilitates and creates convenience among many of the clients in Singapore. • Availability of a systematic way of first in first out. For the need of ensuring that chances of misplacement of things especially, during loading and off loading from the trucks; availability of their professional trained staff aids in organizing and proper way of ensuring ones goods don’t get misplaced. Before the process of arranging ones belongings to be transported, professional consultant is facilitated to offer some sorts of advice to the customer, on how to pack his or her goods. • Availability of big trucks. Instead of one using his salon car for transport, big vehicle which saves time by enabling only one trips to the destinations of the new settlement are facilitated. All big items are safely transported faster and quickly as preferred by the customers within the Singapore. Henceforth for everyone who attempts to relocate his office or moving to a new homes a lot of carefulness must be emphasized especially when trying to pack the items to be transported, in which great care of ensuring all valuables are kept close to him to avoid issues of missing. Proper labeling off all cartons should be done with easily identifiable legible wordings. Singapore as the moving company is well trusted in all matters related to relocation of one office furniture’s and home, therefore becoming well known to all the clients around the county.